TASMANIAN teenage sprint ace Jack Hale hasn’t ruled out returning to SA’s richest footrace after being run out in the semi-finals of the Bay Sheffield on Sunday. Hale, 16, was shattered when he finished a close second to Queenslander Sam Kete in the sixth semi-final at Colley Reserve in Glenelg. With only the semi-final winners advancing to the final, he was eliminated and slumped to the ground in disappointment. 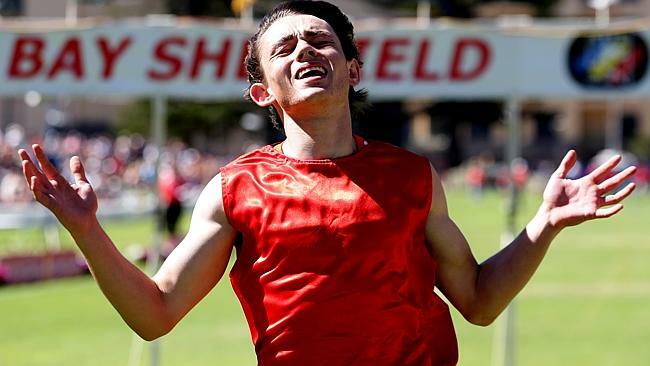 The teenager — Australia’s fastest ever 16-year-old — was off a handicap off 2.75m. He was giving Kete, an accomplished senior sprinter, 4.75m and narrowly failed to claim him on the line. Earlier, Hale had local fans abuzz when he won his heat in the second fastest time of the round, but there was a noticeable sigh as he was eliminated in the afternoon. SA Athletic League Brendan Golden said Sunday’s crowd of more than 10,000 people was the biggest in recent Bay Sheffield history and believed Hale was a factor. The 16-year-old made headlines across the world when he ran a wind-assisted 10.13 sec for 100m at the Australian All-Schools championships in Adelaide this month. “When the crowd is full right back to the start line of the gift, you know you’ve got a big crowd,’’ Golden said. “Hale was definitely a factor, the reaction when he won his heat was terrific.